This document describes how to set up and use AMQ Console to manage AMQ components. 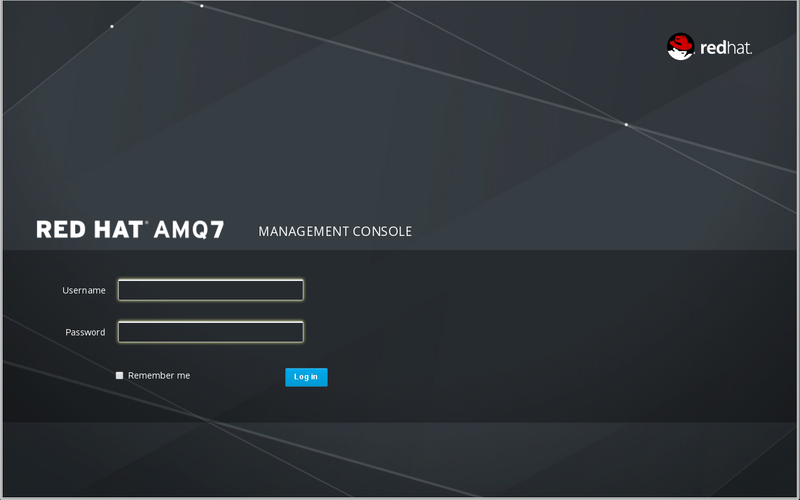 AMQ Console is a web console included in the AMQ Broker installation that enables you to use a web browser to manage AMQ Broker and AMQ Interconnect. AMQ Console is based on hawtio. AMQ Broker and AMQ Interconnect ship with hawtio, which is a modular web console for managing Java applications. They also include plug-ins for the broker and router. The supported web browsers for AMQ Console are Firefox, Chrome, and Internet Explorer. For specific browser versions supported see AMQ 7 Supported Configurations. AMQ Console is distributed as a set of plugins that provide the hawtio web console for Java applications, and custom functionality for managing AMQ Broker and AMQ Interconnect. These plugins are included in the AMQ Broker installation. Therefore, before you can use AMQ Console, you must install AMQ Broker. This is a requirement even if you only use AMQ Interconnect. For more information about installing AMQ Broker, see Installation in Using AMQ Broker. After installing AMQ Console, you can log in and connect to the brokers and routers in your environment. You access AMQ Console through a single broker instance, regardless of how many brokers and routers are installed in your environment. 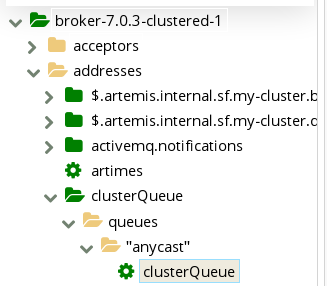 Start the AMQ broker and router instances that you want to manage in AMQ Console. Navigate to the web console address for the broker instance that you started. The web console address is http://HOST:PORT/console/login. If you are using the default address, navigate to http://localhost:8161/console/login. Log in to AMQ Console using the default username and password that you created when you created the broker instance. When you access AMQ Console, you are automatically connected to the broker through which you accessed AMQ Console. If you have additional brokers running in your environment, you must connect to them before you can manage them through AMQ Console. At least one broker instance must be running. In AMQ Console, click the Connect tab. A name that describes the broker instance to which you are connecting. If you have not configured AMQ Console security, choose http. If you have configured security, choose https. The host name of the web server on the broker instance to which you want to connect. The host is defined in the broker instance’s bootstrap.xml configuration file, in the <web> element. The default host is localhost. The port number on which to connect on the host. The port is defined in the broker instance’s bootstrap.xml configuration file, in the <web> element. The default port is 8161. Click Connect to remote server. A new AMQ Console session appears in a new browser window. Before you can manage AMQ Interconnect from AMQ Console, you must first connect to a router running on your router network. 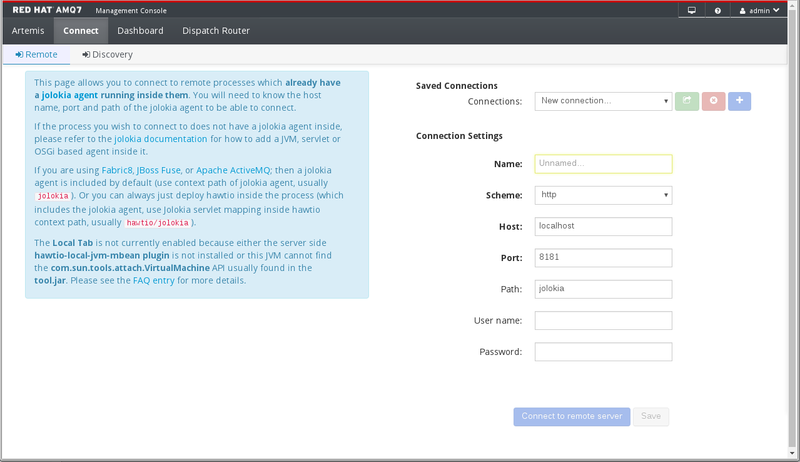 After you connect to a router, you can access and manage any router on the network using the Dispatch Router page. At least one AMQ Interconnect router must be running. The router must have a listener configured to accept HTTP connections. For more information, see Section 4.4, “Configuring AMQ Interconnect for AMQ Console”. In AMQ Console, click the Dispatch Router tab. Enter the Address and Port of the router to which you want to connect. If necessary, enter your Username and Password to authenticate with the router. The Overview page appears, showing a list of all routers running on your network. For each user, you must define a username and password and assign a security role. Users can only log into AMQ Console using these credentials. For more information, see Enabling Password Authentication in Using AMQ Broker. To allow AMQ Console to access resources on the broker, specify the permitted origin URLs that can access it by editing the allow-origin parameters in the access management configuration file on the broker. You must first upgrade to AMQ Broker 7.1.0, during which the access management configuration file named jolokia-access.xml is added to the broker instance. For more information about upgrading, see Upgrading Your Broker to 7.1.0 in Using AMQ Broker. Open the BROKER_INSTANCE_DIR/etc/jolokia-access.xml file in a text editor. To secure AMQ Console when it is being accessed over a WAN or the internet, use SSL to specify that network access uses https instead of http. Change the URI scheme to https. Specifies whether client authentication is required. The default is false, but you can change it to true to enable authentication. The path of the TrustStore file. This attribute is only needed if clientAuth is true. To access AMQ Interconnect from AMQ Console, you must add a listener that accepts incoming WebSocket traffic from AMQ Console. Open the router’s configuration file. The default router configuration file is located at /etc/qpid-dispatch/qdrouterd.conf. If you have multiple routers, you should open the configuration file of the router through which you want to connect to AMQ Console. Add an incoming connection for AMQ Console management traffic. The name of the incoming connection. Either an IP address (IPv4 or IPv6) or hostname. The port number or symbolic service name. If necessary, secure the AMQ Console connection to the router. By default, the router does not authenticate or encrypt the AMQ Console connection, which means that any user can connect to the router anonymously through AMQ Console. However, you can configure the router to use SASL to authenticate incoming connections from AMQ Console. This means that for users to access the router through AMQ Console, they must provide their credentials and be authenticated by the router. In the router configuration file, set up SASL. For more information, see Setting Up SASL for Authentication and Payload Encryption in Using AMQ Interconnect. Configure a secure SASL mechanism for the AMQ Console listener. For more information, see Adding SSL/TLS Client Authentication to an Incoming Connection in Using AMQ Interconnect. You can use the AMQ Console Dashboard page to monitor the status of AMQ, including brokers and routers. You can also create your own dashboards to display the real-time charts, diagrams, and metrics most important to you. Dashboards provide you with real-time data about your AMQ environment. In AMQ Console, click the Dashboard tab. The Monitor dashboard appears displaying real-time data about hawtio. To switch to a different dashboard, click a dashboard tab. You can create new dashboards to display real-time data for AMQ Broker and AMQ Interconnect. Add AMQ Broker data to the dashboard. Add AMQ Interconnect data to the dashboard. Change the dashboard layout as needed. Dashboards contain widgets, each of which can display a chart, diagram, or metrics. You can create as many dashboards as needed. On the navigation bar, click Manage. The Manage page appears displaying a list of existing dashboards. Click the checkbox next to an existing dashboard. Hover over the dashboard name and click the pencil icon ( ). Enter a new name for the dashboard and then click the checkmark icon ( ). You can add any of the available queue and topic charts to a dashboard. You can display Display a chart that you want to add to a dashboard. On the navigation bar, click the Add icon ( ). The Dashboard tab appears displaying a list of available dashboards. Select the dashboard (or dashboards) on which you want the chart to appear, and then click Add View To Dashboard. The chart is added to the dashboards you selected. You can add any of the available Dispatch Router charts that are based on AMQ Interconnect status details. Click the Dispatch Router tab. Display a chart that you want to add to a dashboard. You can display charts about router status. Click Add this chart to a dashboard. 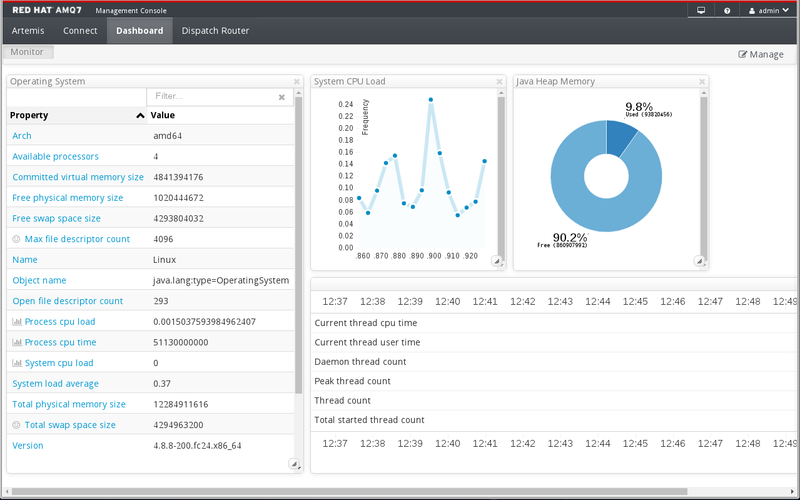 Dashboards contain widgets, which display metrics, diagrams, and charts. You can change the way these widgets are displayed on a dashboard. Click and drag a widget to a new position on the dashboard. Hover over the widget’s title bar and click the Edit icon ( ). Enter a name for the widget and then click the checkmark icon ( ). In the bottom-right corner of the widget, click and drag the resize icon ( ). In the widget’s title bar, click the close icon ( ). You can view configuration properties and their values to see how the broker is configured. On the Artemis tab, in the folder tree, select a broker. A list of configuration properties are displayed for the broker. Connections - Displays information about the client connections. Sessions - Displays information about the client sessions. Consumers - Displays information about the client consumers. Producers - Displays information about the session producers. Addresses - Displays information about the addresses. Queues - Displays information about the queues. Diagrams - Displays diagram of all AMQ Broker resources in your topology, including brokers (masters and slaves), producers and consumers, addresses, and queues. Attributes - Displays information about the configured attributes. Operations - Displays information about the operations that can be executed on the server. Chart - Displays real-time data for the selected attributes. You can view a diagram of all AMQ Broker resources in your topology, including brokers (masters and slaves), producers and consumers, addresses, and queues. On the Artemis tab, click Diagram. This example shows three brokers with 10 queues. To change what objects are displayed on the diagram, click the View drop-down and select the items that you want to be displayed. You can view details about the acceptors configured for the broker. On the Artemis tab, in the folder tree, expand the acceptors folder. Click an acceptor to view details about how it is configured. In the folder tree, select a broker. On the navigation bar, click drop-down icon, and then click Create. A page appears for creating an address. The routing name of the address. Multicast - Messages sent to this address will be distributed to all subscribers in a publish-subscribe manner. Anycast - Messages sent to this address will be distributed to only one subscriber in a point-to-point manner. Both - Enables you to define more than one routing type per address. However, this typically results in an anti-pattern and is therefore not recommended. If an address does use both routing types, however, and the client does not show a preference for either one, the broker typically defaults to the anycast routing type. The one exception is when the client uses the MQTT protocol. In that case, the default routing type is multicast. In the folder tree, select an address. On the navigation bar, click drop-down icon, and then click Send. A page appears for you to compose the message. If necessary, click the Header button to add message header information. In the Payload format drop-down, select an option for the format of the message body, and then click Auto format. The message body is formatted in a human-readable style for the format you selected. To send additional messages, change any of the information you entered, and then click Send message. The address to which you want to bind the queue must exist. In the folder tree, select the address to which you want to bind the queue. A page appears for you to create the queue. A unique name for the queue. Multicast - Messages sent to this address will be distributed to all queues bound to the address. Anycast - Only one queue bound to the parent address will receive a copy of the message. Messages will be distributed evenly among all of the queues bound to the address. If you select this option, the queue and its messages will be persistent. The username to be used when connecting to the broker. The maximum number of consumers that can access the queue at a given time. If selected, the queue will be purged when no consumers are connected. The queue is created. You can access it in the folder tree under the address to which it is bound. Queues for an address are organized into a Queues folder. Within the Queues folder, queues are further organized by routing type (MULTICAST and ANYCAST). Charts provide a real-time view of the status of a queue on a broker. In the folder tree, navigate to a queue. To view a chart for multiple queues for an address, select the ANYCAST or MULTICAST folder that contains the queues. On the navigation bar, click drop-down icon, and then click Chart. A chart is displayed showing real-time data for all of the queue’s attributes. On the navigation bar, click drop-down icon, and then click Edit Chart. In the Attributes list, select one or more attributes that you want to include in the chart. To select multiple attributes, press and hold the Ctrl key and select each attribute. Click the View Chart button. The chart is displayed based on the criteria you selected. Browsing a queue displays all of the messages in the queue. You can also filter and sort the list to find specific messages. Queues are located within the address to which they are bound. On the navigation bar, click drop-down icon, and then click Browse. The messages in the queue are displayed. By default, the first 200 messages are displayed. In the Filter messages text field, enter a filter criteria and then press Enter. In the list of messages, click a column header. To sort the messages in descending order, click the header a second time. To view the content of a message, click the message ID. You can view the message header, properties, and body. In the folder tree, select the queue to which you want to send the message. To send additional messages, change any of the information you entered, and click Send message. You can resend previously sent messages. Browse for the message you want to resend. Click the checkbox next to the message that you want to resend. Update the message header and body as needed, and then click Send message. You can move one or more messages in a queue to a different queue. Browse for the messages you want to move. Click the checkbox next to each message that you want to move. Enter the name of the queue to which you want to move the messages, and then click Move. You can delete a queue or purge all of the messages from a queue. Browse for the queue you want to delete or purge. Click the checkbox next to each message you want to delete. On the navigation bar, click Delete. Click the Purge queue button. Click the Delete queue button. You can use AMQ Console to view important information about AMQ Interconnect routers and the router network, change a router’s configuration, and add new routers to the network. You can view details about routers, message addresses, links, and connections. You can also view the status of the router network. You can view a list of routers in the router network. You can also view detailed attributes for each router. On the Dispatch Router tab, click Overview. In the folder tree, click Routers. The Routers page appears, displaying information about each router on the network. To view additional details for a router, click a router in the table. To sort the list of routers, click a column header. To sort the routers in descending order, click the header a second time. You can view a list of message-routed and link-routed addresses known to the router. In the folder tree, click Addresses. The Addresses page appears, displaying information about each message address known to the router. To view additional details for a message address, click an address in the table. To sort the list of addresses, click a column header. To sort the addresses in descending order, click the header a second time. You can view a list of AMQP links attached to the router from clients (senders and receivers), from and to other routers in the network, to other containers (such as brokers), and from the tool itself. In the folder tree, click Links. The Links page appears, displaying information about each link attached to the router. To view additional details for a link, click a link in the table. To sort the list of links, click a column header. To sort the links in descending order, click the header a second time. You can view a list of connections to the router from clients (senders and receivers), from and to other routers in the network, and to other containers (such as brokers). In the folder tree, click Connections. The Connections page appears, displaying information about each connection to or from the router. To view additional details for a connection, click a connection in the table. To sort the list of connections, click a column header. To sort the connections in descending order, click the header a second time. You can view recent log entries for all of the routers in your router network. In the folder tree, click Logs. The Recent Log Entries page appears, showing a list of the logging modules along with the level at which they’re enabled and the number of available log entries. Click a logging module to view its log entries. You can view a graphical topology of the router network to see how the routers are connected. On the Dispatch Router tab, click Topology. The router topology is displayed. You can view charts about the real-time status of a router, policy, message address, or link. On the Dispatch Router tab, click Entities. A page appears displaying all of the management entities for the router. At the top of the folder tree, select a router from the drop-down menu. The management entities are displayed for the router you selected. To view additional details about a management entity, select an entity in the folder tree. The entity’s attributes are displayed. The Value column shows the value for the router you selected, and the Aggregate column (if applicable) shows the aggregate value for the entire router network. The values and aggregate values of these attributes can be either static or dynamic. Static values do not change unless you change them (for example, the Id of the router). However, the values of some attributes change in real time (for example, the Delivery Count for an address), and are designated by a chart icon. To view the real-time value of an attribute in a chart, click the chart icon next to the attribute’s value or aggregate value. If you modify a router by updating a router management entity, the changes take effect immediately. However, the changes will be lost if the router is stopped. To make permanent changes to a router, you should edit the router’s configuration file. For more information, see Configuration in Using AMQ Interconnect. You can create incoming and outgoing network connections for a router. To create an incoming connection, click listener. To create an outgoing connection, click connector. On the toolbar, click Create. Update the attributes as needed. At a minimum, you must update the Name to ensure that this network connection is unique. You can hover over an attribute to see a definition of the attribute. For additional information about network connections, see Network Connections in Using AMQ Interconnect. You can delete incoming and outgoing network connections for a router. To delete an incoming connection, click listener. To delete an outgoing connection, click connector. Click the listener or connector that you want to delete. The connection is displayed with all of its attributes. You can specify the routing pattern to be used for a message address. At a minimum, you must update the Name to ensure that this address configuration is unique. You can hover over an attribute to see a definition of the attribute. For additional information about message routing, see Configuring Message Routing in Using AMQ Interconnect. If this message address should be routed to a queue on a broker, add an autolink. In the folder tree, click autoLink. At a minimum, you must update the Name to ensure that this autolink is unique. You can hover over an attribute to see a definition of the attribute. For additional information about autolinks, see Configuring Waypoints and Autolinks in Using AMQ Interconnect. If you do not want messages with a particular address prefix to be routed in a particular way, you can delete the message address configuration that defines the routing pattern for those message addresses. Click the message address configuration you want to delete. The address is displayed with all of its attributes. You can create link routes to connect a client to a broker. Set the Dir to In. Update the remaining attributes as needed. At a minimum, you must update the Name to ensure that this link route is unique. You can hover over an attribute to see a definition of the attribute. For additional information about link routing, see Configuring Link Routing in Using AMQ Interconnect. Repeat Step 3 to create an outgoing link route. For this link route, the Dir should be set to Out. To delete a link route, you should delete both the incoming and outgoing link route entities. Click the incoming link route you want to delete. The link route is displayed with all of its attributes. Click the outgoing link route. For each logging module, you can set the logging level, and update where the log messages are sent and how they are formatted. Click a logging module, and then click Update. Update the logging module’s attributes as needed. You can hover over an attribute to see a definition of the attribute. For additional information about logging, see Configuring Logging Modules in Using AMQ Interconnect. You can fetch logs for any of the routers in the router network. A page appears displaying all of the configuration entities for the router. The configuration entities are displayed for the router you selected. Click a log, and then click Fetch. The log is sent to the destination defined in its Output attribute. You can create SSL/TLS profiles to enable a router’s network connections to be secured. An X.509 CA certificate (used for signing the router certificate for the SSL server authentication feature). A private key (with or without password protection) for the router. An X.509 router certificate signed by the X.509 CA certificate. At a minimum, you must update the Name to ensure that this SSL/TLS profile is unique. You can hover over an attribute to see a definition of the attribute. For additional information about SSL/TLS profiles, see Setting Up SSL for Encryption and Authentication in Using AMQ Interconnect. You can delete SSL/TLS profiles that you no longer want to use. Click the SSL/TLS profile you want to delete. The SSL/TLS profile is displayed with all of its attributes.